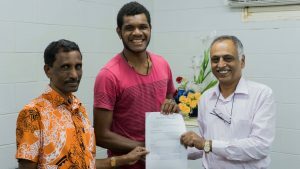 An Economics student at the University of Papua New Guinea (UPNG) has been awarded a scholarship to continue his studies in Australia. Kelly Samof, from Milne Bay, has been awarded the 2018 Economics Scholarship to study at the Australian National University (ANU) in Canberra. “I’m feeling really excited and privileged to go to Canberra next year and rejoin some of the ANU staff who taught me at UPNG,” Mr Samof said. Kelly recently completed a Bachelor of Economics at UPNG, where he will work as a tutor in the School of Business and Public Policy before commencing the Master of International Development and Economics Program at ANU. UPNG’s School of Business and Public Policy Executive Dean, Professor Lekshmi N. Pillai, said the scholarship selection was based on grades, the results of an entrance exam, and interviews with candidates. “The staff at UPNG and ANU were very impressed with Kelly’s academic performance and by his qualities as a person,” Professor Pillai said. Ani Rova, who is currently studying at ANU under the economics scholarship program, said it had been a great opportunity, both in terms of education and personal development. “There are a lot of challenges and I want to encourage Kelly to be well-prepared for the program as well as the cold weather,” Mr Rova said. Each year, ANU academics teach economics and public policy to hundreds of UPNG School of Business and Public Policy students. The institutions are part of the Pacific leadership and Governance Precinct – an initiative of the Papua New Guinea and Australian Governments to strengthen public sector leadership.